This was a genuinely creepy and tense episode - and frustratingly another of the "to be continueds". A little resonant of Alien with the deserted planet with an unseen monster popping off the cast one at a time. And what about poor Donna?? And I'm so intrigued by the whole Doctor not knowing of his future meeting with the professor and her sonic screwdriver. Bring on next Sunday! Apart from the fact that SBS is showing repeats (this one from 2003!) I thoroughly enjoyed my night off from choir and an evening with Top Gear. The other week at a social gathering I mentioned Top Gear and all the women at the table immediately began competing with each other as to how much they loved this show. I did say at the time, that while I also liked it, I found it slightly worrying that I was a Top Gear fan. What is the actual source of attraction to a show about European cars (of which I have no knowledge, and will most likely never own)? The suggestion came back, sensibly I believe, that it was because the hosts actually say what they think and aren't afraid to give a negative opinion. Pretty basic I guess - but I think there might be something in this. Are there any foods that Maggie is not totally in love with? Does anyone really want to eat avocado ice cream? In Year 8 Home Economics we were instilled with the value of aprons, washing our hands and not sticking fingers in the food during the cooking process. Maggie, I fear, would have failed. And just once on these cooking shows I want the cooks to do the final taste test and spit it on the floor in disgust. Raptures, raptures always raptures. They're hairy and they're bikers travelling through Namibia in search of authentic African cuisine. The main question here was - what size entourage is required to carry all the gear and cooking utensils and ingredients so they can prepare food in the most unlikely of places - i.e. the middle of a sand dune? The follow up question was why? 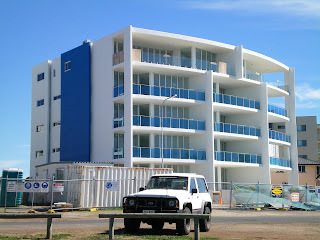 The Hollowmen: Yes I agree, Kirribilli House is a waste of money. But perhaps not in comparison to the Big Brother House. Again a fascinating episode of this documentary series. This time Simon and co looked at the buildings that sprang up from the industrial revolution, from huge mills in Britain's industrial north, to the emergence of terrace housing as a way of combatting slums. I've managed to pass 4000 words on my paper. On reading back through what I have so far, as always i find that the discussion is a little abstract and perhaps not grounded enough by textual examples. Still that is something that can now be remedied. I was just pleased to meet my goal of words for the week! "For these women their bums are their greatest fear and they are about to come face to face with that fear"
A recent post at homecooked theory asks some interesting questions about the state of contemporary cultural studies. One that particularly caught my attention inquired after the whereabouts of the many students who had taken cultural studies courses in the last twenty years or so. This was part of a broader musing as to who the next generation are - those who will take over the work of the some of the "elder statesmen" of the discipline. For me this issue speaks to the difficulty of networking and discipline building. Speaking I suppose from a particularly regional perspective (where if you are looking for a coherent discipline you will be sadly disappointed) I find this discussion can really go begging. My attempts at becoming part of what we might optimistically call "cultural studies" at conferences etc have been right old failures. I think I just don't have the knack for this aspect of academia. What I have found in my own location is that it is the unexpected connections with people in other disciplines that have proved the most engaging academic encounters...often forcing me outside my academic comfort zone and asking me to look at my own work with fresh eyes. The post at homecooked theory also notes that the political potential of cultural studies is that it provides a set of tools with which to critically engage with the world in which we live. I don't disagree, but I often find myself questioning the value of this kind of work. Sure, my research is interesting and valuable to me...but the real challenge is to find a way that it can resonate with the lives and concerns of people outside the academic institution. This is much more of a challenge...and sometimes the skeptic in me wonders whether it's actually necessary to even worry about it. I picked these from the garden this morning. 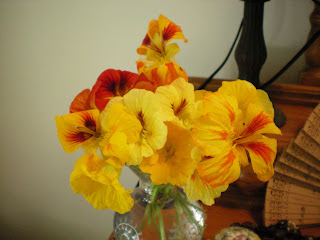 What I love most about nasturtiums is that they are extremely self-sufficient. They require little extra watering and have a fantastic ability to create different coloured and patterned flowers from year to year. They have a lovely old fashioned flower garden perfume. And best of all they self seed from year to year without any help. Last night's rehearsal was a great one, especially for those of us in the pit. Apart from the wonderful stash of lollies (for eating while the dialogue is going on) we also received some very special Oklahoma style hats. It seems it's amazing the difference a hat makes to how much fun you can have while watching a show you have seen hundreds of times already. Suddenly the jokes became a whole lot funnier and the musical numbers so much more energetic and enjoyable. "Disease and depravation stalk our land like two giant stalking things"
Every six months through the writing of my thesis, the university would request something official be filled in and sent back to the research office, signed off by me, my supervisor and my head of school. This was called the progress report. At the time, I found these forms absolutely ridiculous, just another piece of red tape waste of time hoop to jump through. Now, however I am starting to see their value...in principle at least. Because I find that unless I set myself strict deadlines for my various research and writing projects very little gets done. It's so easy for deadlines to slip further and further out of reach, gradually fading into the horizon. So I have to set myself clear short, mid and long term goals for anything to even look like it's getting done. 500 words a day for 8 days out of the next 10. This gives me some leeway...for interruptions at work. It is also a manageable amount of writing to achieve in a day in between actual work duties. That also still gives a further seven days for rewriting and redrafting (which I also do along the way). I have also been finding the 6000 word minimum word limit quite daunting because this is not writing that is being cribbed out my thesis. And I think I have been angsting on it fairly unnecessarily. Because a lot of this writing is "from scratch" (something that has not happened for at least 2 years truth be told) and it seems like I am learning to write all over again at this stage. So what I have decided today, after a sensible conversation with Anne, is just to do as much as I can saying what I want to say and even if it's a bit less, send it in. I also decided that if I don't get it into a form that I feel is right for this particular call I'll finish it anyway and find somewhere else to send it. There endeth the progress report. After a less than inspiring morning at work manfully (should that be womanfully, personfully?) plugging away at my paper, answering emails and phone calls, and then two hours of class which involved a certain amount of counselling the students through their group task, I thought - hey - why don't I go and get a coffee in town at my favourite ever coffee shop, Indulge. Never mind that it's a half hour round trip (including the waiting time for the beverage), it's worth it. And what greeted me? (apart from the usual smiling faces, beautiful food in the display cabinet and the enchanting aroma of coffee)....FREE CAKE THAT'S WHAT. If there's a better way to pick up an ordinary working day and make it wonderful I'm not sure what it could be. Sure it was a baby tea cake - more like a mini muffin really...but it was light, tasty... and free. I was so excited to find a little unexpected act of generosity and kindness in the day...they may have thought I was a little nutty. Coffee was yummy as well. Well it's getting closer now to when Oklahoma actually opens. Just over a week in fact before we begin playing to real audiences. So all the last minute things are starting to be put in place up at the theatre. Sets are being painted, costumes finalised, hair and makeup all starting to happen. We now also have an orchestra in the pit. Well not actually a full orchestra but some strings, a flute, clarinet, trumpet, trombone and percussion. And it sounds pretty good if I do say so myself. And we're really just running the show in full at every rehearsal. So this afternoon we began at 1 and finished at 5:30. It was a long but productive afternoon, although a little concerning that one of the leads couldn't sing today...but I guess that it's better now than on opening night. But the highlight for me was when the auction scene came together bee-yoo-ti-fully in Act 2. 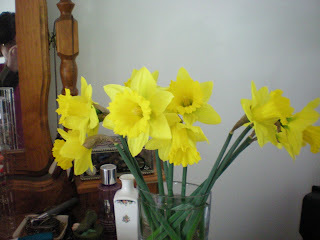 It was Daffodil Day yesterday, so I bought a bunch of daffodils. They looked like nothing in the shop. But when I got them home, trimmed the stems and placed them in the vase the blooms suddenly grew into huge, beautiful flowers. If you look carefully you'll see the photographer reflected in the mirror. Some might call this artistic. I call it not paying attention when I was taking the photograph. Still, it's all very Wordsworthian which adds a little poetry to the day I suppose. Well once again the week was dominated by the Olympics extravaganza so non-sporting televisual enjoyment was a little difficult to find. I did my best though. Why didn't Grant Hackett just go a little bit faster?? I'm sure it's more frustrating and disappointing to lose by a little rather than a lot. These are the episodes I like the best with The Doctor going back in time to a particular historical period. When I was very young my mother read Agatha Christie constantly. There seemed to be a series of publications out at that time with very disturbing and graphic covers. The one that first springs to mind was I think a vicar with a tennis racket instead of a head. So what was fun here (apart from the wonderful 1920s fashions and seeing Felicity Kendall so many years after The Good Life) was watching this episode with my mother who took great delight in detecting the book titles in the dialogue! Simon Thurley and his team of architects and historians are dreadfully earnest but this episode was the most interesting yet as they looked at the changes to the countryside resulting from the agrarian revolution. In particular the Piece Hall (I think that's what it was called anyway...might have been Piece Mall?) at Halifax was an astonishing building once one of the busiest markets in Northern England. I'm looking forward to next week's episode which will look at the buildings of the Industrial Revolution. Dougall: Where is he then Ted? Ted: He's having some tests? HaHaHaHaHa.... Everyone in my lounge room laughed out loud. Corny but funny nonetheless. I watched the first half hour and then went to bed. Beautifully styled....but as my mother and Catriona at Circulating Library both observed - why do they have to muck around with these books when they adapt for television? archery on the lawn anyone? This week I watched Pride and Prejudice with Laurence Olivier and Greer Garson in the leading roles. Having seen it many years ago (prior to my seeing the classic Colin Firth BBC production) I was keen to watch it again. I remember then thinking the costuming was a little strange, and now I know why. The women's costumes were nightmares in puffed sleeves, bows and all manner of decoration. And the hats were absolutely hideous...huge, high bonnets stacked with flowers and frills. There were stripes and polka dots everywhere they turned and the skirts were monstrously wide in a sort of Gone with Wind style. Anyway apart from the weird costumes, there was a strange scene where the ball at Netherfield was actually a garden party with Lizzie and Mr Darcy exchanging quips over an archery lesson. There was also a strange turn at the end with the redemption of Lady Catherine (here visibly working in cahoots with Darcy). Yet the characterisation remained surprisingly true to the book under the circumstances. Greer Garson was delightful as Lizzie and Olivier was suitably restrained, then gentlemanly, as Darcy. I just finished watching my way through Guys and Dolls (I had started it on Saturday and made it nearly to the end). This now seems a rather uneven musical. There are some fantastically memorable songs (sit down you're rockin' the boat, luck be a lady etc) as well as some lengthy and terrifically forgettable numbers. It's also not paced very well - or perhaps it is that the balance is not quite right between dialogue and song. Very lengthy scenes with a short song at the end. And some of the songs are almost incidental in terms of furthering the understanding of character or narrative. Still, the good songs are great and it's a treat to see the young Frank Sinatra and Marlon Brando singing away. One thing I did wonder - do New York gangsters have an objection to the apostrophe or contraction. All their dialogue was "I do not think" I would not see..." rather than "I don't" and "I wouldn't". It had an artifical formality - clearly the librettist was looking for a particular tone to set the gangster milieu, but it seems peculiarly dated now. "to write is to draw a map"
Thankfully it has been a more productive day today. I persevered with the Arrested Development paper for some time, and although it was slow going I am starting to see a real way forward here, making connections with some previous work as well as considering some new possibilities. I also spent some more time on the research presentation for a couple of weeks time. Our own connections to Foucault - before beginning reading. So here we talk about out specific areas of research and what, if any, influence Foucault had been to this point. So it's fairly straightforward. The main aim is not to talk about what's in the book - but rather the ramifications of engaging in a reading project like this, particularly in a regional community where the practice of research can often be fairly isolated. As I went through and started writing some notes out, I went back and did a little background reading, particularly to see if there were any useful comments by other writers that we could incorporate into the presentation. And I came across one that had really struck me in my initial reading of Deleuze's book on Foucault (which is a fabulous read by the way). "To write is to struggle and resist; to write is to become; to write is to draw a map: 'I am a cartographer'' (1988, p. 44). I really like the ideas I feel this quote encapsulates about writing. That writing is necessarily creative, productive - producing a new territory or a shape, constructing a landscape that is both imagined yet very real. It's been a somewhat frustrating and sometimes annoying day today. I had taken half a day's leave yesterday and today - and while yesterday was enjoyable as I came home and had a little nap before trotting out for coffee and cake, this afternoon was less relaxing. I had lunch out with some friends and then had to race home to teach the piano. I have a student sitting their grade 7 exam in just over a week and it's getting down to the nitty gritty in lessons - all the fine polishing and details. I don't whether it's the late nights catching up with me or what, but I just didn't have the energy for this today. I felt really antsy by the time the afternoon was over and just really wanted to lie down on my bed and relax. And the morning wasn't particularly productive at work either. By the time I was just getting settled into some writing a student wanted to come and see me about their assignment. This was fine and they are a lovely student but it did sort of cut the morning in half somewhat. And this meant I didn't really get as far as I would like. Yes I'm feeling tired, cranky and little sorry for myself...I know this always does pass...fingers crossed for soon! It was a perfect winter's morning on Sunday and we took the opportunity of some spare time to go walking at the beach. 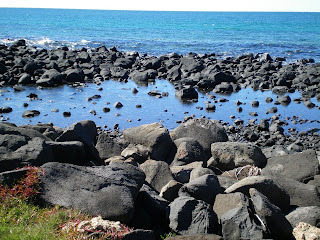 As usual the water was glittering and the sky a brilliant blue. 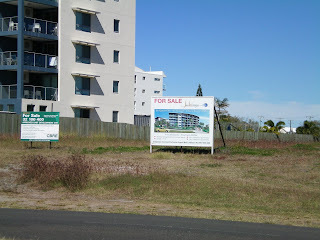 It's astonishing though, how quickly Bargara is being ruined by the construction of high rise apartments. They're all concrete block, airconditioning units and (I imagine) stainless steel European appliances. And gradually all the grand old beach houses are being moved on, or torn down to make way for this wonderful "progress". Although there are still a few that are holding on, in spite of the monstrosities arising all round them. Bargara used to be really little different to Bundaberg in terms of population, but go down there during the week and it's packed with retired couples walking hand in hand along the foreshore, in their sleeveless vests and joggers. You'll also experience a whole different walking etiquette - or rather lack of walking etiquette. Where I walk around my house just about everyone you meet will greet you with a "hello", "good morning" etc. That is, they actually dare to make eye contact and you feel part of a virtuous little walking community. 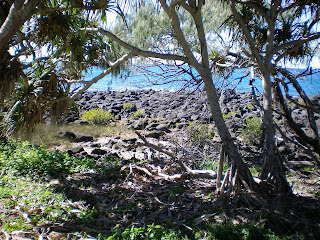 In Bargara on Sunday we encountered plenty of people walking, but it was all dark sunnies and looking assiduously in another direction as we crossed paths. It's the luxury of mid-term vacation here this week which means no students and no classes. So I am taking advantage of this little oasis in time to get stuck into some of my more pressing research projects. I spent the morning writing up some ideas for the presentation on September 5 with Anne. And this afternoon I forced myself to start writing the Arrested Development paper. I made it to 500 words in a very short time which was exciting and I feel like I still have some good direction for continuing tomorrow. It's interesting to consider the different types of writing I engage in during the day. Email is a big one...it's mainly perfunctory communication without any real need to craft the content. While quite often the academic writing of papers and presentations is like a slow torture, that requires reflection, endless drafting and tweaking to try and say just what I want to get across. It's made more challenging by the fact that I have come to the realisation that I am a shaper. I can make all the preliminary notes and plans in the world and they all come to nothing once I begin to actually write. I've rarely stuck to a plan and find that my best ideas are those that emerge during the actual writing process. Clarity emerges from the drafting and the rewriting process and my arguments are never fully formed until right at the last minute. However, I do feel that this blog sits somewhere in the middle. I tend to use it as a mechanism for encouraging me to actually write...just something...whether it is well formed or not. Some posts are quick and to the point. But then it is also useful for reflecting and working through an idea (as with the writing about Foucault reading). And although I've only been doing this a relatively short time, I think what I saw today was a little payoff from this daily practice. That is, once I actually started writing this morning on my various projects I was able to get something on the page without quite so much agonising. Maybe it is that the blog encourages me to stop second-guessing myself, to have the courage of my own convictions and opinions, to realise that what I write is mine and I can happily take responsibility for it. That is, slowly but surely it may be counteracting what my supervisor calls "the imposter" syndrome of the research student...where you have the uneasy feeling that sooner or later people will find out that you're simply not up to this business of research and academic writing. And perhaps that will never fade entirely, but the more effort I put into writing and expressing ideas about all sorts of things, the more confidence might grow in my writing. 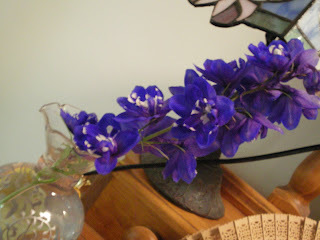 Way back in May I bought a punnet of delphiniums on an impulse. . They're either terrifically slow bloomers or I planted them in the wrong place or this just isn't the climate for them. Whatever, finally in the last week one has sprung up with a flower. So blue! Well of course all week it's been Olympics. Saturday and Sunday: Two days of rather boring telecasts. Beach volleyball has a real lack of energy. I think it's because once the ball hits the sand it's dead, no bouncing, no nothing. Similarly dull viewing with badminton (same problem as beach volleyball) and soccer - so frustrating with the lack of scoring. However, the gymnastics and the diving are real delights - a combination of technique and artistry. And the swimming is always exciting as well (except this year it's on in the day when I am at work so I'm mainly watching it in replay). I decided I would eat lunch at home so I could actually catch some of the swimming finals. Such jingoistic one-eyed commentary! It's gold or you're an un-Australian loser apparently....You could just feel the disappointment from the commentators when Leisel Jones won silver not gold. However the highlight of Bruce McAvaney's commentary so far was his description of Michael Phelps trying to "climb Mt Spitz". Are Roy and HG ghostwriting for the seven commentary team now? Yes I know it seems unlikely but weightlifting is a great sport for TV. It's quick and to the point, as well as being full of drama. Similarly, after about two minutes of watching table tennis I could really see the appeal of this game (when it's played at a high level). It's fast and furious stuff. In the words of the man in the hat, do yourselves a favour people and watch it if there's any more in the broadcast. Thank you thank you thank you ABC 2 for the reruns of Father Ted on Friday nights. Technically, I didn't actually watch it because I went out, but I would have. Father Dougall is so endearingly moronic. Back to the Future trilogy on DVD. Discussing the Olympic swimming with my mother yesterday, I was a little surprised when she informed me that Claudia Schiffer had been beaten into bronze behind two Chinese swimmers. This was nearly as hilarious as our chat about opening ceremonies a week earlier where she tried to get me to remember the one with "Lenny" and something about a duck. (Finally we worked out she meant Leunig). There's a lovely episode of Seinfeld ( let's face it actually they're all lovely) where Elaine ( I think) and someone (I forget who) have an argument about coincidences. In particular, they disagree as to whether there are degrees of coincidence - that is, are some coincidences bigger than others? I mention this because sometimes they way things come together freak me out just a little bit. I can't decide whether it's actually serendipity (and let's not mention bad John Cusack movies here) or coincidence but today I spent some time trying to get started on a possible article about Arrested Development. As usual I had no clear idea about the direction I would take this in and used up most of the day doing some fairly random reading and noting a lot of dead end ideas and little questions. Then it occurred to me (fairly late in the day I must admit) that I should return to the call for papers for some guidance. "By examining failures we can get a better sense of the true impact of successful projects and programs, as well as an improved understanding of marginalized or contradictory modes of production, discourse, and reception"
With yesterday's Foucault still ringing in my ears about the "lyricism of marginality" I'm hoping I've stumbled upon a line of argument regarding Arrested Development and the television mockumentary style more generally that might be fruitful to pursue. Serendipity...big coincidence...little coincidence...just dumb luck....I think I'll leave that for others to decide. Well we finally made it to the end of Discipline and Punish this morning. We worked out that we took 10 months as we officially began around October last year. Although it must also be noted that the beginning of this year saw 3 or 4 months when we got nothing done at all because of teaching and other commitments. So where did we get to? Well Anne moved from being a mild Foucault-skeptic to this morning during our discussion emphasizing (in no uncertain terms) Foucault's "brilliance" - and that's a direct quote! ( I was very proud). This morning we worked through the final two sections of the book: "Illegalities and delinquency" and "The carceral". Strangely enough we attacked them in reverse order which perhaps disrupted the continuity slightly. We may have been distracted by the arrival of our coffee and cakes. (brioche again for anyone who's interested). Nevertheless the topsy-turvy discussion proved productive. In "Illegalities and delinquency" Foucault looks at how the perceived failure of the prison system to actually stamp out delinquent (criminal) behaviours in fact signals the success of discipline. For without delinquent behaviours, the disciplinary operations of surveillance, examination, observation and normalization have nothing to work with. So in this way, the 'prison succeeded extremely well' (p. 277). What we also found interesting here was Foucault's explicit analytical technique, where he shows his willingness to look at the prison system in a new way. He asks, 'But perhaps one should reverse the problem and ask oneself what is served by the failure of the prison; what is the use of these different phenomena that are continually being criticized?' (p. 272). Next job....to write up our presentation for September 5. It was f-f-f-f-f-freezing at rehearsal last night. I know I've whined a lot about the temperature at the theatre, but really last night it got to the point where I really wanted to wrap myself in a blanket like a little old granny. It was a long rehearsal too. We're getting to the stage of running the show through. And even though there were lots of people away for various reasons this is what happened last night. We did Act 2 and then at a about quarter past nine started on Act 1. Act 1 is the monster act - song after song after song, including the dream sequence at the end. When 10:20 arrived and we were only about two thirds of the way through I upped and left. Leanne could play. So I'm wondering what time they decided to finish. My punishment for this piking out however, was all the hot water had been used up by the time I arrived home. So I couldn't get warm under the drizzly cool shower. If I'd stayed at practice longer then the water might have warmed up again. It's gentle and melodic with a pervasive melancholy. It was the annual Christmas in July celebrations last night and a jolly time was had by all. I know that technically it's already August. It just happened that not everyone could make weekends in July so we took the liberty of improvising into the following month. Apart from the mountains of delicious food (mmmm...golden syrup dumplings) the highlight of the evening is always the gift giving. The tradition is a sort of anti-Christmas secret Santa arrangement. Firstly, each guest finds the worst thing in their house that they want to get rid of and wraps it in beautiful Christmas paper. I can usually rely on my hoard of presents from various grandparents to supply something. This year I took a glass vase painted with pink flowers and a glitzy green beaded photo frame. Then half way through the evening we all gather round the tree and each get a raffle ticket. When your number is called you get to choose a gift from under the tree. The first person has the choice of all the gifts. The second person chooses their gift, unwraps it and then can decide whether to keep what they chose or swap their gift with the first person. The third person then chooses their gift and can choose to keep their own or swap with either of the first two...and so on. So it's clearly best to be last in the raffle because you get the choice of everything in the room. In past years I have taken home an old iron fry pan that had been used as a skateboarding jump, a pair of knee pads, a twee dried flower decorated photo frame and many more pieces of junk. This year however I struck gold and managed to hold on to the recurring gift that appears every year, and that everyone wants to win. 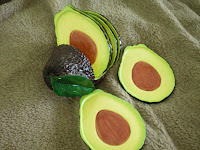 Yes, it's a set of drink coasters in the shape of an avocado. I'm sure you can all see why this is so popular....so instead of throwing it in the bin (as is the usual fate of my gift) I'm keeping it for next year. It was a poor week for television viewing. I think all networks are scheduling rubbish in preparation for saturation Olympics broadcasting for the next two weeks. Also I was out every night except Friday which made TV viewing a rare occurrence. I love it when there's a topic of which I have a passing knowledge. This week - Enid Blyton's Malory Towers books. When I was about 8 I really wanted to change my name to Daphne or Gwendoline because of these books. (Maybe Enid Blyton is as evil as they say). Now that I am more mature I can understand why my parents found this hilarious. Doctor Who: What I didn't understand was why, when the Doctor set fire to the atmosphere, didn't the buildings and everything else burn up as well. Minor scientific quibble I guess. Martha, it seems, is destined for another adventure. And yet another tantalising glimpse of Rose! Does the ABC think we're all nitwits? (N.B. rhetorical question no answer required). There is a reason they schedule British comedies in between two of their higher rating and better quality programs (Spicks and Specks and The Hollowmen). It's because, as was the case with Freezing, they're a pleasant way to wile away half an hour while you're waiting for the program you actually want to watch to begin. Sure, the cast was attractive and there were some mildly clever lines at the expense of the world of fame and celebrity, but really, this wasn't "must-see TV" for me. From now on it's only citrus highlighters for me...and definitely no asterisks or bullet points. And, like The Hollowmen's mysterious Prime Minister I have no problem with lowering standards, as long as nobody notices. Boom boom! Peter Garrett was curiously un-charismatic. And Bronwyn Bishop (somewhat scarily) the opposite. The half hour I caught Julian Morrow said nothing...what was the point here? It was too late for me...I went to bed...now waiting to see highlights! Because if there's one thing we all love every four years it's a monstrously overblown, symbolic and portentous opening ceremony that is not really suitable for watching on television. An article by Frank Devine in The Australian today on The Hollowmen spent some time dissecting what he thinks is wrong. Chiefly, the problem seemed to be that it isn't Yes Minister/ Yes Prime Minister. He observes that the program is "short of a finished product", "lacking in character, motivation, conflict, suspense, denouement", "with no characters that can engage our sympathies". He also finds it "hard to tell characters apart" and argues that "comedy needs a moral compass to bounce laughter off". I'm the first to agree that Yes Minister/ Yes Prime Minister is high quality political satire and television comedy. I'm not so sure though that it is relevant to compare The Hollowmen with these fine series. For, television comedy has changed a great deal in the last 20 years or so. I think The Hollowmen can be placed within recent transformations in the genre, where we find both the visual and narrative style heavily influenced by the documentary....the mockumentary. So, identifying or sympathising with characters is not always the highest priority. Rather I think what this style of comedy does is reveal what purports to be a slice of life to us, to a great extent leaving the audience to draw their own conclusions. That is, unlike Yes Minister/ Yes Prime Minister in The Hollowmen the distinctions between the characters are blurry - because the "moral compass" (if we can even believe there is such a thing any more) they are locked into is also complex and blurry. The conflict is not so much between the various characters - but between all the characters and the world of media spin and public policy making that they inhabit and must manipulate the best way they can. No one wins or loses...they simply move on to the next event, the next emergency, the next phase of the media cycle and attempt (sometimes hopelessly) to have some, even minute effect on the strangling and paralysing discourses (there! I've used some naughty poststructuralist language) within which "contemporary politics" now emerges. I'm sure I'll continue to think about this...and perhaps even change my mind! Well it's Friday afternoon and I have actually managed to send my revised article back on time. For all my procastinating over the reference list once I sat down yesterday and made myself attack it, it didn't really take too long. Isn't this always the way? Sadly though, the time I have spent on these revisions this week meant that the book revisions and writing took a back seat - AGAIN. I'm giving myself a deadline of the end of August to be through all chapters once. Then I can take a step back and try to decide what really needs doing in terms of the overall project. The Great Bookclub Poetry Experiment was deemed a great success by all those in attendance (Jan and Anne H - we missed you!). Jan had kindly sent along the comic relief in the form of a Tasmanian teatowel with a lovely little ditty about beer, "The bitter end". Jinx injected just the right amount of drama into her reading! And what a variety the rest of us supplied. Anne kickstarted things with Henry Lawson's Faces in the Street. A bleak ballad of social injustice written when Lawson was just 21, rather than hearing it read, we listened to it as set to music by The Bushwhackers. Which is the bliss of solitude"
Lorraine's first choice was a great success, a poem she taught many times, AD Hope's Advice to Young Ladies. I, for one had never encountered it before and enjoyed it's take on gender expectations and politics. My first choice was also a poem from high school, Keats' To Autumn. I remember this because it was the first poem I really enjoyed analysing in depth for a school assignment. 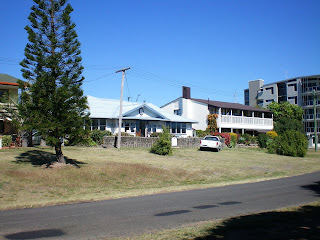 Living in Queensland, autumn was rather a foreign concept - especially in the way that Keats describes it. And even though colour is not really invoked, for me the imagery of this poem conjures up an autumnal glow. Anne's other two choices were from a contemporary anthology of Arab-American poetry, Grape Leaves. We enjoyed two of these selections for the way they described the cultural politics of everyday life. Hither I come to seek the spring,"
"What passing bells for these who die as cattle? -Only the monstruous anger of theguns. And bugles calling for them from sad shires." They'd banish us you know. What do I like about this? Well I think it shows a wry sense of humour, a conversational, conspiratorial style as well as intense disdain for the business of self-promotion. I was going to choose something else by her - but so many of them are about death and after the desolation and loss of faith in The Hollow Men I thought I should choose something a little cheerier. All in all, lots of laughs, and jokes about Gerard Manley Hopkins. The best thing was the fact that we made the time to read the poems aloud. For we agreed that this is the way to really appreciate the poet's skill. We are all keen now to bookclub song lyrics.....but next time it's a science fiction book chosen by Lorraine - A Canticle for Leibowitz by Walter Miller Jnr. I've never heard of it, let alone read it but am looking forward to it. In The Australian today is a report of David Tennant performing in Hamlet. The reviewer for The Times noted: "I've seen bolder Hamlets and more moving Hamlets, but few who kept me so riveted throughout". Well for someone who likes a good musical I've discovered I was a little dopey when it came to Oklahoma. I always thought that the big showstopping title number was the finale...but it seems not. (I'm guessing the majority of the cast were aware of this long before me!) As we worked our way through Act 2 last night it seems that the song is the high point of the second act after which there are two fights, one resulting in a death - and then the actual finale. I think this is an unusual dramatic arc for a musical...and perhaps explains why Oklahoma is considered a classic - for the way it developed the genre. How often does junk email prove to make your day? Well, this morning I was excited to receive an email from Threadless telling me the reprint I had requested some months ago was being produced this week. The original purchase was thrown out along with lots of other clothes and all my shoes - ruined in the great Davis flood of February 2008. I had loved that t shirt. So today it will credit card at the ready!! I see a great Russian writer has died. Maybe I should now finally make myself read Ivan Denisovich. On a very shallow note, whenever I hear the phrase "Russian writer" I always think of the Seinfeld episode where Elaine made a fool of herself, by insisting the original title of War and Peace had in fact been "War, what is it good for?" At first I was really excited that our bookclub this week was going to be "our favourite poem". However, after skipping through some poetry over the weekend I realised the impossibility of such a task. For me it's like asking "what's your favourite song?" - a question which I am really unable to answer. It all depends on the year, the week, the moment, what sort of day I have had - as to the type of music I feel the need to listen to. I can go for ages without listening to any classical music at all, and then suddenly will have a burst of non-stop classic fm, digging out my old cds of violin concertos and piano music that have been gathering dust for years. It's the same with contemporary and pop music. It's been years since I went back to some songs and artists and then a phrase or fragment of a melody will enter my mind and I'm off. I feel poetry might work the same way. I read back through some of the poetry that really spoke to me 15 years ago and found it so over the top in its romanticism that I almost couldn't bear to read it. So it might be that there is no such thing as a favourite poem, just as there is no such thing as a favourite violin concerto or favourite book or song...just works of art that we need more at certain times rather than others. It was a fairly light afternoon at rehearsal today for me. We worked over Farmer and the Cowman again - revising what was blocked on Thurday night. Following that there is a long section of dialogue (the auction) which meant no music and I could have a pleasant sit down and watch the proceedings. Up until now the orchestra pit has been covered over but I get the feeling it's only a matter of time until the covers come off and I am banished to the depths of the theatre (in crazy phantom of the opera style) instead of being up in the auditorium with everyone else. The pit has the real piano which is much nicer to play but it makes it very hard to see what's happening on stage. And the view from the pit is just a lot of dancing feet. Just finished watching the Broadway Musical documentary. The last couple of episodes took us up to 2004 when Wicked had just opened on Broadway. I'm wondering if I'm in the minority, never having been particularly fascinated with the Wizard of Oz mythology in its movie form. I agree the Over the Rainbow is a classic song and Judy Garland does a fabulous job of singing it in the original film - but I've only ever felt the need to sit through it once. Still, clearly the success of Wicked (just now opened in Melbourne) shows there's plenty of audience appeal for a story "inspired" by the Wizard of Oz. Interesting though that The Australian's review of the Melbourne show noted that the production has everything going for it, except perhaps, classic songs....I wonder. Maybe though, great songs are no longer essential to a successful musical? Really I just wanted the Tour de France update, even though I knew Cadel Evans had failed to take back the yellow jersey in the time trial. His second place certainly hadn't impressed the panellists, and I had to sit through 15 minutes of football code argy bargy before the cycling was even mentioned. Poor Cadel...at least he didn't cry I guess. There's always next year. This ABC 2 showing of the Audrey Hepburn and Fred Astaire vehicle was notable for his skilful dancing (at the ripe old age of 58) and the fairly noticeable age gap between the two stars. Oh - and her stunning Givenchy wardrobe. This week Breakfast at Tiffany's - Moon River one of the most beautiful pop songs every written. At about 8:05 I looked at the clock and it dawned on me that this was going to be a "to be continued" (I'm a bit slow!) So we leave Donna's Grandpa suffocating in the car and the world on the verge of extinction until next Sunday evening. Darn it!! This episode also gave me a whole new perspective on the navman....it is creepy that we obey their instructions without question. Isn't it? Also the coincidence of reading Foucault on the panopticon and surveillance the day before this episode was a little freaky as well. Andrew interviewed Gordon Ramsey the swearing celebrity chef. Although I only caught the second half when I arrived home from choir, I seem to remember that Andrew's interview with Jamie Oliver also featured the choko and other foods. Was this explicitly addressed when he presented them to Gordon? Anyway, I'm curious as to the cultural fascination with chefs and cooking. Are they celebrities simply because they devote themselves to the artistry of an everyday task (like cooking) that so many of us no longer have the time or energy for? Although in Ramsey's case I suspect a fair chunk of the celebrity comes from the unceasing propensity for swearing. (Disclaimer: I'm a Jamie girl myself). Hungarian food hey? Well, one thing I didn't know is that there are SEVEN types of paprika (that's right...seven!). And then host Maeve O'Meara clearly articulated what I'm sure all viewers were thinking - that Hungarian food is "carbohydrate heaven". I love carbohydrates. Not sure Maeve was so enthralled though, in spite of her usual "mmmmms" and "aaaahs". She seemed a little less enthusiastic than normal. "They're ministers - not thinkers". Surely not?! Beautiful as always. I know it actually screened on Thursday, but due to rehearsal I was catching it on Friday. Why, why, why, why was this final????? Why, why, why, why, why British television production company executive whoever you are did you decide not to make any more? In the week of boring television this was a little ray of sunshine - and now it's finished. So frustrating! A colleague loaned me the dvds of this fascinating documentary about the Broadway musical and I've managed to fit in the first three episodes. If, like me, you're a sucker for a catchy tune then musicals might well be for you. So fascinating to see the development of this wonderful 20th century art form from vaudeville, through the Ziegfield follies to the golden age defined by Rodgers and Hammerstein and then beyond. Who knew Irving Berlin could only play the piano in the key of C? The sections that dealt with the untimely deaths of Gershwin and Hammerstein were moving, particularly when we learn that Edelweiss was the last song Rodgers and Hammerstein collaborated on. I actually had a little tear or two. And the old footage of Gene Kelly in Pal Joey was so delightful....that man could dance! Is this the afterwork snack of champions? I was okay sitting at the piano but by the end of the night everyone looked exhausted! I'm sure all that dancing is better than going to the gym.